About the test (Gallup, Wikipedia). Take the test (Clifton StrengthsFinder 2.0, ~$15 but totally worth it!). Strategic — Formulates goals, plans, & contingencies. Explores & evaluates options & consequences. Diagnoses, solves, & prevents problems. Ideation — Is flexible, innovative, & efficient. Finds patterns & mistakes. Provides clear explanations. Brainstorms & creates solutions on the fly. Learner — Masters new systems & skills. Easily shifts between projects. Unafraid of the challenging & unknown. Eager to learn & improve. Input — Manages information & resources: investigate, catalog, categorize, organize, systematize, integrate, access, document, & disseminate. Intellection — Breaks down complex concepts. Creates explanatory models. Communicates clearly with excellent vocabulary. About the test/system (Keirsey, MyPersonality, Similar Minds, Personality Page, Human Metrics, LifeExplore, Wikipedia). Take a free test (Similar Minds, Keirsey, MyPersonality, Human Metrics, Personality Page). Take a free test (Similar Minds). 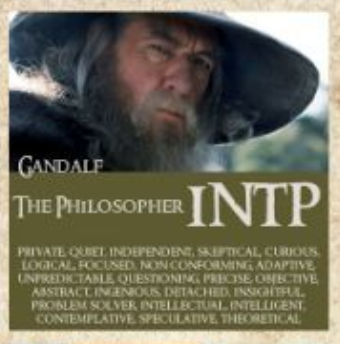 I have a strange mix of INTP & INFP functions. About the test (MyPersonality, Wikipedia). Take a free test (MyPersonality). About the test (Similar Minds, Wikipedia). NOT Conflict-Seeking, NOT Paranoid, NOT Vain, NOT Hedonistic, NOT Wealthy, NOT Hypersensitive, NOT Materialistic, NOT Avoidant, NOT Needing to Dominate, NOT Histrionic, NOT Change-Averse. About the test (Personality Online, Similar Minds, Wikipedia). Happiness is what life is all about. I can find pleasure from almost any source. Familiarity breeds comfort, contentment, & inspiration. I avoid wide social networks & celebrity. I like an emotionally secure environment. About the test (Similar Minds, Enneagram Institute). Take a free test (Similar Minds, Enneagram Institute). Fives are observers: they have an overwhelming need to understand the environment and therefore are curious about everything. They tend to satisfy that curiosity by standing at the periphery rather than by getting centrally involved, or by investing heavily in their own units while sacrificing their relations with the larger organization. They frequently are knowledgeable in numerous areas and seem to enjoy learning purely for the sake of learning. This desire for knowledge may be generated by a need to protect themselves from an environment that they see as unpredictable or capricious. Fives use their knowledge as the raw material for building expertise, models, world views or organizations that serve as a home base for them. Not surprisingly, they are the most intellectually gifted of the types. In addition, they are highly independent-minded and are sensitive to outside forces that might deprive them of their independence. Nines need to avoid conflict and tension. They want to preserve harmony with others (or at least with key others) and to keep peace whatever the cost. They are often suite capable of ignoring anything which might disturb this essential harmony. They also prefer things to remain stable, and they resist change or disruption. Take the free test (Similar Minds). The Discoverer’s overriding goal is to go where no one else has ever gone before. About the test (Similar Minds). Gallup Strengths Center (SF) — StrengthsFinder 2.0, ~$15/top 5 … totally worth it!